Who invented the Gas Mask? There are several inventors who should be mentioned in the invention and development of the gas mask. The ancient Greeks used sponges as a defence against poisonous weapons. The Banu Musa brothers of Iraq designed a gas mask device to protect workers working in polluted wells. Alexander von Humboldt invented the first miners gas mask with a respirator. John and Charles Deane invented a smoke protecting device for firemen and Lewis Haslett invented an "Inhaler or Lung Protector". However, the name of the person credited with inventing the modern Gas Mask is the African American inventor Garrett Morgan. Definition of the Gas Mask: The Gas Mask is defined as a mask-like safety device used for military or industrial purposes that filters air through charcoal and chemicals to protect the wearer against poisonous, noxious gases and smoke. Who invented the Gas Mask? Garrett Morgan is not only famous as the African-American inventor of the modern Gas Mask but also as a businessman and entrepreneur. Garrett Morgan invented the modern Gas Mask in 1914, during the WW1 period of invention (1914 - 1918). 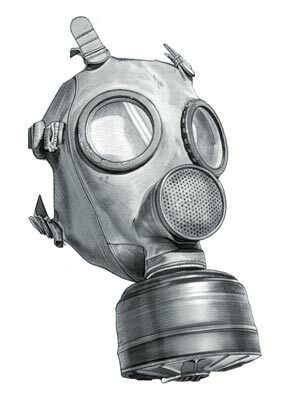 The invention of the modern Gas Mask originated in America and is considered a principal achievement and a life saver. Fact 1: Who invented the Gas Mask? The modern Gas Mask was invented by Garrett Morgan in 1914 during the WW1 era of inventions (1914 - 1918) which was a leading addition to advancements made to combat toxic gases released during wars. Fact 2: Who invented the Gas Mask? The different types of airborne toxic gases such as chlorine gas, mustard gas and phosgene gas were developed for use in World War 1. The first use of poison gas was on the WW1 Western Front on 22 April 1915 by the Germans at Ypres, against Canadian and French troops. Fact 3: Who invented the Gas Mask? Prior to the invention of the Gas Mask by Garrett Morgan in 1914 other inventors had developed different types of helmets to help with breathing problems experienced by fire fighters, miners and divers. Fact 4: Who invented the Gas Mask? Ancient Greeks: Poisonous weapons were deployed by the Ancient Greeks and the common sponge was used in ancient Greece as a primitive type of gas mask. Fact 5: Who invented the Gas Mask? Banu Musa brothers: Another primitive gas mask was invented in 850 AD in Baghdad, Iraq. It is detailed in the "Book of Ingenious Devices" by the Banu Musa brothers, famous Arab mathematicians and astronomers. Their gas mask type of device was designed to protect workers working in polluted wells. Fact 6: Who invented the Gas Mask? Alexander von Humboldt: Whilst working as a mine inspector the Prussian explorer Alexander von Humboldt (1769 - 1859) invented the first gas mask with respirator for the use of miners. Fact 7: Who invented the Gas Mask? John and Charles Deane: In 1823 John and Charles Deane invented a smoke protecting apparatus for fire fighters. Their invention was described as a smoke helmet made of copper with a long, leather hose attached. Fact 8: Who invented the Gas Mask? Lewis Haslett: In 1847 Lewis Haslett of Louisville, Kentucky invented an "Inhaler or Lung Protector" for keeping dust from entering the lungs. Fact 9: Who invented the Gas Mask? Garrett Morgan: Garrett Morgan was motivated to such an extent by the gases being developed in WW1 that he was destined to become famous as the African-American inventor of a Gas Mask that was suitable for use against toxic gases. Fact 10: Who invented the Gas Mask? The inventor of the modern Gas Mask, Garrett Morgan, was born on March 4, 1877 in Cleveland, Ohio, United States and died on July 27, 1963. Fact 11: Who invented the Gas Mask? The early years of Garrett Morgan were spent in Cleveland, Ohio, United States where he was raised by his family. Garrett Morgan was educated at basic education to a sixth-grade level and did not undertake higher education at a University. Despite this drawback he went on to be a highly successful and prolific inventor. Another famous invention by Garrett Morgan was the electric automatic Traffic Light. Fact 12: Who invented the Gas Mask? Following his education his first job was as a sewing machine repairman for a clothing manufacturer and in 1907 went on to open his own sewing machine repair shop. Garrett Morgan had a knack for creating equipment to be used in his business. Fact 13: Who invented the Gas Mask? Garrett Morgan was so successful that he expanded his business to include a tailoring shop. He then moved into the publishing business and established the 'Cleveland Call' newspaper. His interests covered a variety of subjects and his analytical and mechanical mind led him to create many inventions that solved different problems. Fact 14: Who invented the Gas Mask? The invention of the Gas Mask by Garrett Morgan was made in 1912 and was patented in 1914, the year that World War 1 erupted in Europe. His invention was described as a Safety Hood and Smoke Protector. Fact 15: Who invented the Gas Mask? His invention of the Gas Mask became acclaimed when it was used in the 1916 Waterworks Tunnel Disaster beneath Lake Erie in Cleveland . On 24 July, 1916 workmen digging in a water intake tunnel 50 feet below the ground hit a pocket of natural gas. A spark triggered an explosion of the gas that killed 11 men and 10 rescuers who were overcome by gas when they entered the pressurized tunnel. Fact 16: Who invented the Gas Mask? Garrett Morgan became the hero of the day due to his brave action and his invention of the Gas Mask. Garrett Morgan, his brother Frank and 2 others put on Garrett Morgan's Gas Masks and, at the request of the Cleveland police, entered the deadly gas-filled tunnel. Sustained by Garrett's Gas Masks, they rescued 2 men and recovered 4 bodies. However, officials from the U.S. Bureau of Mines stopped further rescue and recovery efforts due to the danger. Fact 17: Who invented the Gas Mask? News of the rescue spread across the country and requests for Garrett Morgan's Gas Masks began pouring in from fire departments across the USA who wanted to purchase the new gas masks. Fact 18: Who invented the Gas Mask? Garrett Morgan's invention became the prototype and precursor for the gas masks used during World War I protecting soldiers from poisonous gas. George Eastman, the inventor of the Kodak camera, developed unbreakable glass lenses for gas masks. Fact 20: The invention of Garrett Morgan's earned him the first prize at the Second International Exposition of Safety and Sanitation in New York City.